Fall comes in early October in northern Michigan and just a bit later around the shores of Lake Michigan and the Grand Traverse Bay. 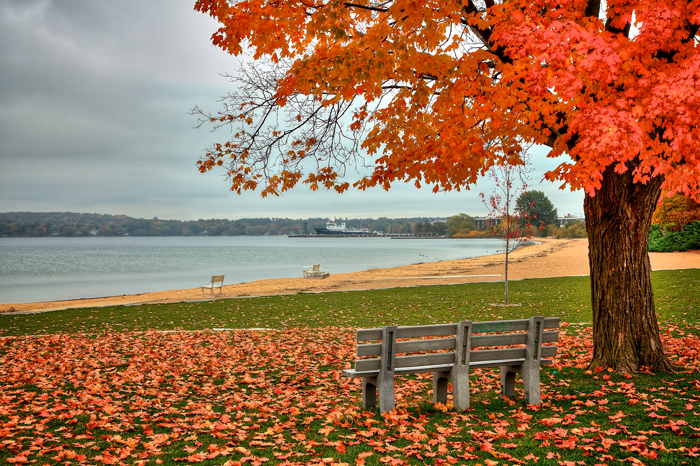 Pictured here is a bench under a colorful tree looking out towards Grand Traverse Bay. Fall in Traverse City, Michigan by Joey B. Lax-Salinas is licensed under a Creative Commons Attribution-NonCommercial-NoDerivs 3.0 Unported License. Permissions beyond the scope of this license may be available at http://www.joeyblsphotography.com.